Sesame Street Puppets are a novelty that children enjoy and through which they can learn and express themselves. These puppets are bright and colorful, incorporating the various Sesame Street characters with whom your kids are so familiar. Elmo, Bert, Ernie, Cookie Monster, Oscar, Zoë, Big Bird and Grover – they’re all here. Sesame Street puppets encourage play. Puppets, including Sesame Street Puppets, allow such a wide range of play experiences. Fantasy play, dramatic play and language play are all encouraged by these toys. Your child’s manipulative skills are also called upon when playing with puppets. 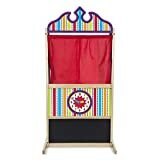 At around 12-15 months old children begin pretend play. At this early age the objects they pretend with need to be very realistic. Parents can help them develop this type of play by modelling or prompting pretend use. Sesame Street puppets are characters familiar to your kids and act as a good basis for imaginary play. Children will use these puppets to model other characters – like Mummy and Daddy. By three years old this type of pretence occurs spontaneously within children’s play. Imaginary objects or actions can come into play without any real stimuli. At 3-4 years old children can adopt pretend relational roles and can accept different character transformations as part of their pretend play. The Sesame Street puppets allow a large range of pretence play including that of different roles and different situations. There’s such a wide range of characters each with their own personality. The Sesame Street puppets allow toddlers to practice their language skills. 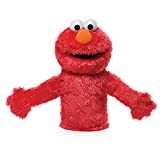 Applying different dialogues and vocabulary to a particular character – Elmo speaking in a high voice and Big Bird using big words – allows kids to assess and assign different roles and related attributes to the puppets. It’s a real benefit for children to understand and perceive the way that others may speak and act. The use of puppets can help a child to explain their own feelings when their vocabulary and powers of expression have not developed sufficiently. The important thing to remember when choosing Sesame Street puppets is to look for durability. Inevitably, these puppets are going to be much handled by both parents and kids alike. Very small puppets may get chewed upon and pose a choking hazard. Check also for eyes and other small objects that may become detached and get swallowed. I like toys that are bold, bright and big – and so do not pose these problems. Machine washability is always a bonus. Check the size of the Sesame Street puppets. Beside the risk of small puppets getting lost younger children generally prefer the larger models. 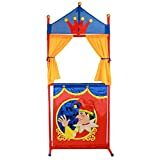 Pick puppets from a reputable supplier so you are assured of good quality materials and manufacture. GUND have been around since 1898 and were started by Mr Adolph Gund. They were America’s first plush toy company. They are renowned for creating teddy bears and a have a reputation for using the highest quality materials and skills in order to create these plush characters. They have been responsible for pioneering many safety innovations and are actively involved in developing toy safety regulations and making safe toys for children. No assembly and low maintenance. As these are plush toys they will require the usual fabric maintenance. No assembly is required – just innovative ideas to get your child going on the road of imaginative play. 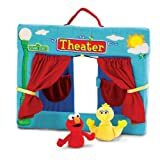 This Puppet Theatre comprises a 12” free-standing colorful theatre, one 3” Elmo finger puppet and one 4” Big Bird finger puppet. 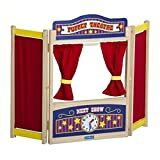 The freestanding theatre will allow your children to put on their own shows using the finger puppets. All of the items in the Sesame Street Finger Puppet Theatre are brightly colored and will engage your child in play for hours. The cast can be supplemented with additional characters – obtained separately. A parent may find these finger puppets useful when teaching children language skills, telling stories, or just for plain pretend play. Whichever of the Sesame Street puppets you choose; more sets props and general scenery can be created by your child using basic arts and crafts materials. Ask your child what their favorite story is and work out that story using the puppets. Try and engage your toddler into asking questions about each of the characters and why they are doing particular actions/tasks within the story. Ask your child how the characters in the story will be feeling and encourage your child to see through the eyes of the various players. Try and keep it simple. Ask questions like “Why do you think that the princess is crying?” Get your children to answer and explain using the puppets. Keep it interactive and a lot of new ideas and thoughts should emerge. A playing and questioning child is a learning child. Also, helping a child see things through the eyes of another, as complicated as that sounds, will improve their social skills. Remember keep it simple and a lot of fun should follow. From 3” to 4.5” in height, this range includes puppets of all the favorite Sesame Street characters that your children will recognise and enjoy. 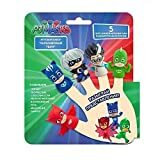 I like the idea of being able to purchase these finger puppets individually as it enables you to pick and choose your child’s favorite characters. With a range of eight characters including Elmo, Bert, Ernie, Cookie Monster, Oscar, Zoë, Big Bird and Grover you will be able to find the characters that your child adores. I think that a major benefit of having the full range of characters in this genre is that it offers a wide option for creative and imaginative play. 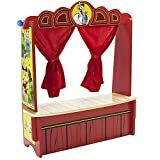 Sets for the characters can be made for your chosen puppets. For example, a trash can, to accommodate Oscar, can be made from old toilet tubes. The only drawback, that I can identify, with these small toys is locating them when your toddler has pushed them underneath the furniture! These toys can be collected and are very reasonable priced . These are 13” Sesame Street Hand Puppets and offer the choice of Big Bird, Elmo, Oscar, Grover, Cookie Monster, Bert and Zoë. These Sesame Street puppets are a good size to fit both children’s and adult hands. They are in bold bright colors. These puppets are fun for both you and your toddler. I like these big and bold puppets. They won’t get lost or eaten and I like the variety of characters. Affordably priced . An alternative to Sesame Street Puppets ? You’ll find some interesting alternatives to Sesame Street Puppets in our review of Hand Puppets for sale or you may select another toy category from the sidebar. This set of four puppets includes Sweet Girl, Clown, Japanese and Chinese Girl.Color them, wash them clean and start afresh. These delightful puppets are 19″ high. They are tall, soft and come with six coloring pens. Suitable for toddlers of age 3 and up. These hand puppets combine a craft element with the imagination and pretend play of puppets. What makes them stand out is that the puppets are all female and represent the multi racial nature of our community. I also like the fact that these little puppets are machine washable. They can be used time and time again in a creative, educational and fun manner. Prices are accurate as of April 25, 2019 11:13 pm. Product prices and available are subject to change. Any price and availablility information displayed on Amazon.com at the time of purchase will apply to the purchase of any products.